Northern Goods and Trade is a general store in Chorrol's Chapel Street. It is found in Chapel Street, near the South Gate and across the street from The Oak and Crosier Inn. The proprietor, Seed-Neeus, is a trader with 800 gold and a Mercantile skill of 40. She also offers Advanced Mercantile Training. When bartering, she will buy anything but weapons and armor while only selling a variety of miscellaneous items. Her wares include the unique Boots of the Swift Merchant, which fortifies your Mercantile, Speed and Speechcraft while giving you Weakness to Disease and to Poison. Note that your Mercantile skill must be at least 50, as without the Journeyman-level perk Seed-Neeus doesn't sell armor. The shop also sells all of the upgrades for Arborwatch for base prices of 1,500, 1,800 or 2,000 gold (depending on which upgrade). 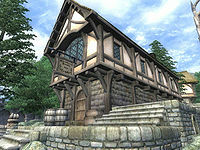 Her store is set up reversely, compared to typical Chorrol stores: the main trading room is on the second floor and contains a selection of Seed-Neeus' wares on display, a writing table and a dining table. The ground floor contains some miscellaneous storage and Seed-Neeus' private quarters, which consist of a small room with a bed, a wine rack and a small library. Her daughter Dar-Ma lives with her. Esta página foi modificada pela última vez à(s) 20h40min de 20 de abril de 2013.